I went back to work last week, and it’s not quite so busy yet but still calls for the usual later evenings. 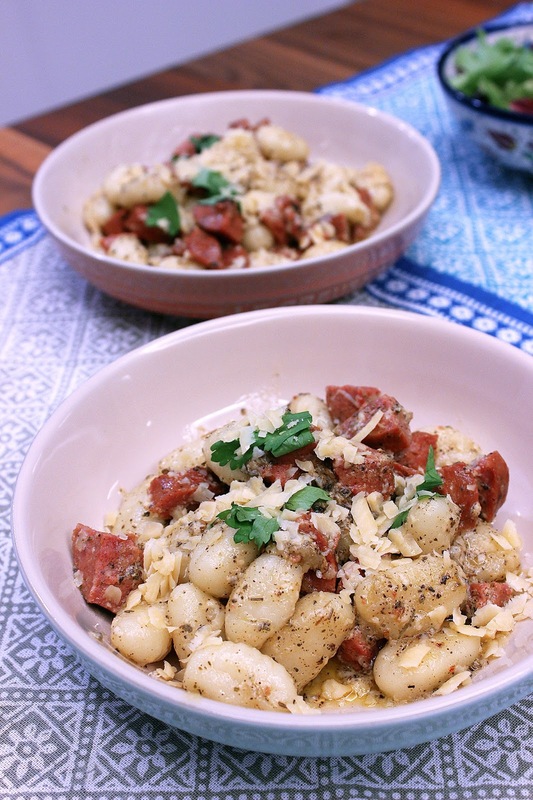 So on Friday night, after a week of craving (quite inexplicably) gnocchi, I decided to cook up this super simple, super easy, super tasty dish for the hubs and myself. Also, since I’ve done less and less baking and more and more quick weeknight cooking, I thought I’d start sharing more of those recipes (assuming I figure out my lighting issues for photography at night). So for all you working people out there who want to whip up quick, no fuss dinners for yourself or to impress your significant other with your culinary skills, here’s one of many weeknight dinner recipes I aim to share. Cook the gnocchi according to the packet’s instructions (pop in a pot of boiling, salted water and strain as soon as they come to the top). Optional: Add the salami to the skillet and stir to mix and coat everything in delicious buttery goodness. Serve immediately with another generous sprinkling of parmesan, and if you, like me, have leftover parsley you don’t want to waste, toss that on too. Why not?